Originally published on Abe Books. 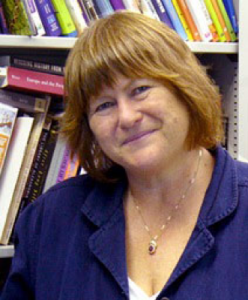 Rebecca Knuth — an expert on book burning — is an Associate Professor in the Library and Information Science Program at the University of Hawaii. She has written two books on the subject — Burning Books and Leveling Libraries: Extremist Violence and Cultural Destruction and Libricide: The Regime-Sponsored Destruction of Books and Libraries in the Twentieth Century. Abe — Why is book burning such an emotional subject? Abe — Would you say book burnings arise from a mob culture or is it more complex? Abe — Why are books burnt so often? Abe — Why have the Nazi book burnings acquired such infamy? Abe — Do you expect book burnings to continue? Abe — Don’t people who burn books simply appear crazy? Abe — Don’t book burnings inspire readers/authors to fight even harder for their freedom to write and read what they wish? “Wherever they burn books,” observed the German poet Heinrich Heine, “they will also, in the end, burn human beings.” These words were written in 1823, more than 75 years before the start of the century in which their prophecy would be so grotesquely fulfilled. In her new book, Libricide: The Regime-Sponsored Destruction of Books and Libraries in the Twentieth Century (Praeger, 2003), University of Hawaii professor Rebecca Knuth examines attacks on books and libraries as aspects of larger patterns of ethnocide and genocide. Using case studies from the last century in which book destruction was employed as a strategic instrument of large-scale violence against either external or internal enemies—against Jews within Germany and against other ethnic and national groups throughout Europe by Nazi Germany; by Serbs in Croatia and Bosnia; by Iraq during its occupation of Kuwait; and by China, both through its internal Cultural Revolution and in its annexation of Tibet—Knuth investigates both the symbolic and practical function of books and libraries in zones of military conflict. She spoke with Cabinet senior editor Jeffrey Kastner by phone from Honolulu. Cabinet: What brought you to the book project? Rebecca Knuth: Libricide began with two questions really—what distinguishes people who mourn the destruction of books from those who destroy them, and how can the ideals of human progress be reconciled with the mass violence and destruction of culture that characterized the 20th century. It seems to me that there’s a lack of analysis in most accounts of the destruction of books and libraries—you get these sorts of emotional witness accounts that describe the damage and then typically proceed to attribute the violence to barbarism. It’s a seductive explanation, but it fails to recognize two critical factors: the political nature of written records and the fact that such destruction often follows a common pattern. The destruction of books and libraries is often goal-oriented and carefully rationalized within struggles between opposing worldviews. Although you point out that there’s a long history of this behavior, your book is concerned specifically with the 20th century. As I did the research for the book, I began to realize that a pattern was emerging and I could most successfully nail that pattern for the 20th century. It’s parallel to the idea that mass murder has always existed, but in the 20th century we have this newly defined phenomenon of genocide. So when I linked libricide—the destruction of books and libraries—with genocide, I felt that it was important to lay out parameters that I could sustain. I also felt that locating it in the modern era might help shift the discussion away from the model that looks at this whole question of book destruction from the point of view of bibliophiles—of people who have this relation to books as precious objects, who want to run their hands over them—and more in the direction of thinking about free information and open discourse and its relationship to humanism and democratic societies. You note that the destruction of books has been used in both symbolic and also very real and tangible ways within different conflicts. Yes, it does have a symbolic function, but it’s also practical and pragmatic. A lot of the information that’s destroyed is the type that sustains—historically or culturally—the other side. If you want to dominate an enemy, you have to neutralize or negate them; take away any sort of information that stands up against you and the type of political and social approaches you want to implement, or that supports the memory of whatever system was operative before the conquest. And one of the most interesting aspects of your book is just how many different kinds of contexts you set out. There’s a very heterogeneous array of behaviors that fall under the rubric of libricide; it’s an activity that has a number of different impetuses behind it and that serves a lot of different purposes. Reactionary ideologies like nationalism, militarism, imperialism, racism, as well as revolutionary ideologies like Communism—all of these are implicated in these instances of destruction. And very often more than one is present in any given situation. The first major incidence of libricide you cite in the 20th century was the German destruction of the library at Louvain in Belgium, during World War I. Yes. During a six-day period in late August 1914 during which the Germans sacked the city, they destroyed some 230,000 volumes at the library, including a collection of 750 medieval manuscripts and more than a thousand incunabula. The telling thing about that incident was that they destroyed the Louvain library in World War I and then promptly destroyed it again in World War II, almost as if to repudiate any of the outcry over the first destruction. In fact, strategic attacks on cultural institutions were formally incorporated into German war theory through the notion of the kriegsbrauch, which stated that “war cannot be conducted merely against the combatants of an enemy state, but must seek to destroy the total material and intellectual (geistig) resources of the enemy.” The German situation with regard to this is interesting—there were public book burnings held there in the mid-19th century as a means of protesting the government, of expressing the desire for greater freedom. 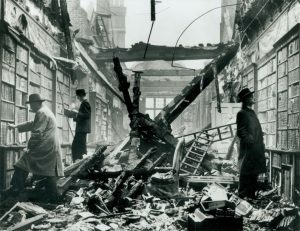 Holland House Library, London, after a German air raid in October 1940. It’s also interesting for what it suggests about another part of this equation—this strain of book destruction that, for the people who do it, is seen not as a retrograde behavior but as a sign of progressivism; this idea that the past, history, is the enemy that needs to be identified and neutralized. There’s a lot of precedent for that. As an aside, it’s also a dialectic that informs contemporary views about things like the destruction of the Alexandrian library. Alexandria was obviously one of history’s greatest libraries—it tried to have a comprehensive collecting policy, to have every major text. It was also a research center; it brought in scholars from around the world, and so it was like a tremendous think tank. There are a lot of stories about how it was destroyed—that it was burned by the Romans, that it was destroyed by the Muslims when they took the city, that they burned the texts to fire the bathhouses. No one is really sure. And just as scholars have argued different positions about its causes, there are also different opinions about its meaning—there’s the idea that it was a horrible loss to civilization, but also that it was an important creative impetus to new growth and study. Those lines of reasoning are also present around the issue of book destruction—individuals involved with extensive destruction of libraries often believe that their ideology demands the expunging of the past, of the old ways of doing things. That it’s a revolutionary process; that it purifies. This would be primarily within a given country, as a kind of internal revolutionary instrument. Yes, but then you get into this very nebulous thing about what is internal versus external. The kinds of extremist ideologies that employ this kind of destruction often contain some notion that the activity is designed to reunite or reconstitute certain national or ethnic constituencies that have for whatever reason been separated. This was certainly the case with the Serbs, who consciously destroyed libraries, not to mention other aspects of cultural patrimony, in Croatian cities like Zadar, Vukovar, and Dubrovnik. One three-day attack with incendiary devices on the National Library in Sarajevo in August 1992 destroyed more than 1.5 million books. Or the Iraqis, who announced that Kuwait was the 19th province of Iraq. In their six-month occupation, Iraqi troops looted and destroyed every library in Kuwait. By some estimates, 50 percent of all book stocks in Kuwaiti public and school libraries were lost. Also lost was the entire collection of the Kuwait University library, more than half-a-million books, and Kuwait’s national archives. Likewise, the Chinese who went into Tibet in the late 1950s and early 1960s—and destroyed what one scholar has estimated to be 60 percent of that country’s extant philosophical, historical and biographical literature—would say that Tibet was an internal struggle. China figures in two of your case studies—the one about Tibet and one that details the internal destruction of books and libraries as a result of the Cultural Revolution. For me and I think many others, the Cultural Revolution has always loomed as an inexplicable phenomenon, where a country just savaged itself and its extraordinary cultural heritage. What I realized as I went further back was that it all began with the Great Leap Forward—even today, the Chinese are much more reluctant to discuss the Great Leap Forward than the Cultural Revolution. It was ultimately a fight between the moderates and the radicals over the course of the revolution. And revolution, as posed by radicals, chews up books and libraries, chews up culture. There’s also the fact that information props up science and technology, all the things that were to be displaced by revolutionary fervor. I think there are parallels to what happened in Pol Pot’s Cambodia—where they essentially exterminated the entire intellectual class—and the track that Mao was on. Obviously, most ideologues tend to be anti-intellectual. They may value texts if they support their ideology or they may value them on a personal level—as, ironically, did both Pol Pot and Mao—but they’re very leery of the ideas in books. Most battles over the fate of books and libraries are finally battles between extremist ideologies and humanistic democracy—between illiberal ideas and liberal ideas, between repression and human rights. They often stem from anti-intellectual, anti-cosmopolitan, anti-modern, anti-international attitudes. That was definitely motivating the Taliban, which I discuss just at the end of the book. It was also motivating Pol Pot and Mao. It’s actually operative right across the board. When the Nazis had the book fires and Goebbels stood up there and gave his famous speech about burning the un-German foundations of Germany—triumphantly proclaiming, “The past is in flames!”—he was reacting against this whole question of humanism and the impulses towards an international world culture. When al-Qaida Islamists invaded Mali, and then Timbuktu in 2012, among their targets were priceless manuscripts—books that needed to be burned. But the damage could’ve been much worse if not for men like Abdel Kader Haidara, who risked their lives to protect the medieval works. He and others succeeded in smuggling out 350,000 manuscripts, proving not only how much the books were valued, but also the lengths to which ordinary people were willing to go to save them. It was a remarkable victory in the long history of books threatened by would-be arsonists—and a relatively rare one at that. Books and libraries have been targeted by people of all backgrounds for thousands of years, sometimes intentionally and sometimes as a side-effect of war. In 213 B.C., Chinese emperor Qin Shi Huang (more widely remembered for his terracotta army in Xian) ordered a bonfire of books as a way of consolidating power in his new empire. According to historian Lois Mai Chan, “His basic objective was not so much to wipe out these schools of thought completely as to place them under governmental control.” Books of poetry, philosophy and history were specifically targeted, so that the new emperor couldn’t be compared to more virtuous or successful rulers of the past. Although the exact amount of information lost is unknown, Chan writes that the history genre suffered the greatest loss. Qin was only one in a long line of ancient rulers who felt threatened enough by the ideas expressed in written form to advocate arson. In Livy’s History of Rome, finished in the 1st century A.D., he describes past rulers who ordered books containing the predictions of oracles and details about celebrations like the Bacchanalia be outlawed and burned to prevent disorder and the spread of foreign customs; philosophers Giordano Bruno and Jan Hus both took positions counter to the Catholic church, the former for his work on Copernican cosmology, the latter for attacking church practices like indulgences. Scholar Hans J. Hillerbrand writes that the executioner charged with killing heretics like Bruno and Hus was often the same person who put flame to their books. But for Rebecca Knuth, author of Libricide: The Regime-Sponsored Destruction of Books and Libraries in the Twentieth Century and Burning Books and Leveling Libraries: Extremist Violence and Cultural Destruction, Qin and religious leaders like him are only a small part of the early book-burning equation. “A lot of ancient book burning was a function of conquest,” Knuth says. Just look at one of the most famous examples of burning, the destruction of the Library of Alexandria. The famed building had its contents and structure burned during multiple periods of political upheaval, including in 48 B.C. when Caesar chased Pompey to Egypt and when Caliph Omar invaded Alexandria in 640 A.D. The unifying factor between all types of purposeful book-burners in the 20th century, Knuth says, is that the perpetrators feel like victims, even if they’re the ones in power. Perhaps the most infamous book burnings were those staged by Adolf Hitler and the Nazis, who regularly employed language framing themselves as the victims of Jews. Similarly, when Mao Zedong took power in China and implemented the Cultural Revolution, any book that didn’t conform to party propaganda, like those promoting capitalism or other dangerous ideas, were destroyed. More recently, the Jaffna Public Library of Sri Lanka—home to nearly 100,000 rare books of Tamil history and literature—was burned by Sinhalese Buddhists. The Sinhalese felt their Buddhist beliefs were under threat by the Hinduism of Tamils, even though they outnumbered the Tamils. Even when the knowledge itself isn’t prevented from reaching the public, the symbolic weight of burning books is heavy. “Books are not absolutely dead things, but do contain a potency of life in them as to be as active as that soul was whose progeny they are,” wrote John Milton, author of Paradise Lost, in his 1644 book Areopagitica. “Who kills a man kills a reasonable creature… but he who destroys a good book, kills reason itself—” an idea that continues to be espoused in modern culture, like in Ray Bradbury’s Fahrenheit 451. This is a problem archivists at the Smithsonian Institution regularly tackle, including electronic records archivist Lynda Schmitz Fuhrig. Even though the technology exists, transferring written documents to digital archives requires time and money—resources that aren’t always available. Sometimes doing so is counter to the beliefs of whoever happens to be in power. Just consider that under President George W. Bush EPA libraries were threatened with closure in 2006, spurring the American Library Association and scientists working at the EPA to put pressure on Congress to ensure the EPA’s budget could cover the cost of maintaining the libraries (although some libraries were closed, they reopened in September 2008). Or look at the scientific research documents that were locked away or destroyed under the Stephen Harper government in Canada in 2014, which had a chilling effect on the topics that could be researched and the studies that were published. As scientist Steven Campana, who spent decades working for Canada’s Department of Fisheries and Oceans, told Smithsonian.com, “Although we still kept our jobs, we basically were prevented from actually doing any science.” Though the methods may be different (and less visible) than in the past, the results are the same: knowledge is purposefully taken from the public. Technology has undoubtedly changed the way we share and save information, but Knuth argues that the core motivations for book burning, in whatever form the act takes, remain the same: prioritizing one type of information over another.